Dr Dinesh Agarwal, Senior Technical Advisor- Health, Nutrition and WASH gets exclusively covered in The Mint (National Newspaper) on 30th January,2019 on “Ayushman Bharat Scheme”. 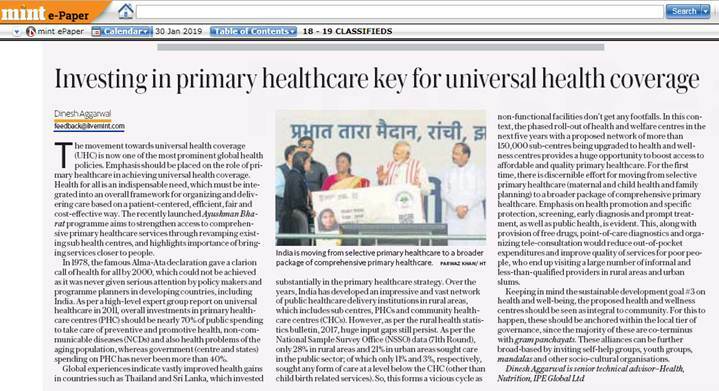 The article talks about “Investing in Primary Health Care-key for Universal Health Coverage" and the scheme which has been designed keeping in mind the 71st NSSO Survey. As Dr. Dinesh qoutes, "For the first time there is discernible effort for moving from selective primary health care (Maternal and Child Health and Family Planning) to broader package of comprehensive primary health care, while we ensure that sustainable development goal #3 is kept in mind, proposed health and wellness centres become an integral part to community", he also talks about how the newly set up Health and Wellness center (HWC) will be able to cater for nearly 80 percent of routine health care needs.